This was my arm after the accident. I’m sure these are the technical terms the Ortho and ER staff use to describe such injuries. Those of you who follow me on Twitter will know that last week, I was in a biking accident on my way to work. 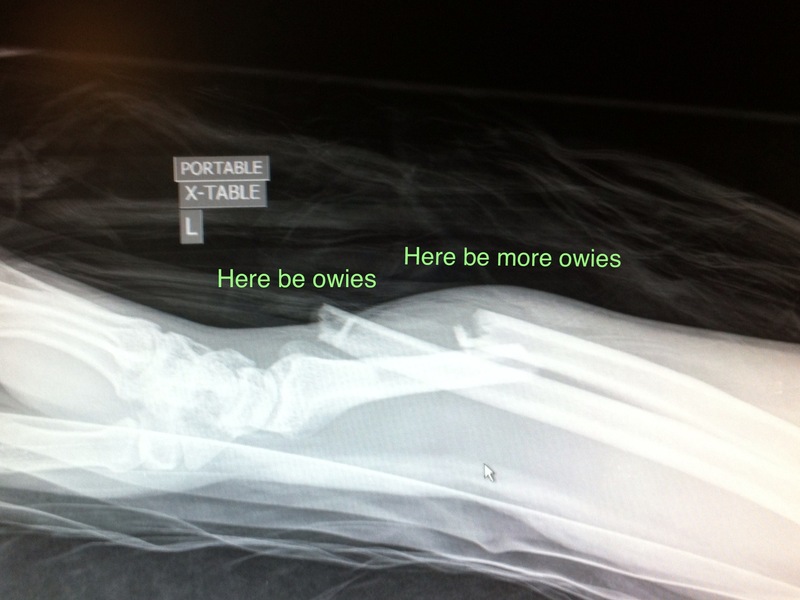 While avoiding a pedestrian, I hit the curb and fell off my bike, resulting in me breaking both the radius and ulna in my left arm. I’m going to try and work around it, but there likely won’t be any new posts in the next little while as I deal with the monster cast I have on and then rehab. Please, please, please, if you’re riding a bike, wear a helmet. I’ve literally biked this route every day from March – October every year that I’ve been in Kingston. If I wasn’t wearing my helmet, I don’t know if I’d be writing this message to you today. Get better Atif! Hope you get right back on the bike as soon as you can! Feel better soon! And I hope you can get right back on the bike as soon as you can! What effect/s will health care reform (Patient Protection and Affordable Care Act, 2010) have on the development of advanced technology? If you need to you and Think about the variables of cost, equity, and geographic distribution. Thanks fellow road warrior and college student at Excelsior. Thanks for the comment. Unfortunately my knowledge of the PPAC Act is limited – I’m not sure what effect, if any, it would have on development of advanced technology. I imagine it could impact profits or payment schemes, but I’m not sure.